Soak rice in water for half an hour and strain it. In a thick bottomed pan add ghee. Add half of the onion and sauté till it turns brown. Remove the onion from the ghee. Now in the same ghee add cloves, cinnamon, cardamom and the remaining onions, rice and sauté for 3 minutes. Add 4 cups of boiled water to it along with required amount of salt and cook with the lid closed. 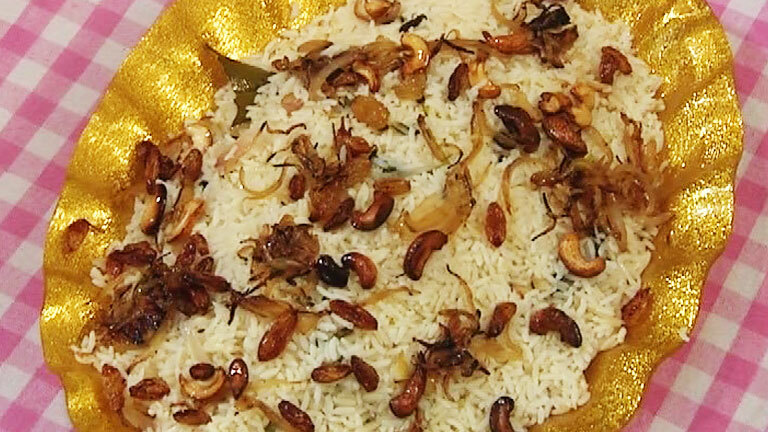 When the rice is cooked, add 1 tsp of ghee, cashew nuts, sautéed onion and pepper powder. Mix well and serve with vegetable curry or chicken curry.